Paul wrote to the church of Ephesus, that he desired their prayer support as he shared the mystery of gospel with anyone who would listen. The mystery still abounds today. Perhaps this is part of the mystery. Every once in awhile there is an event that makes you scratch your head in wonder. This week in church there are people making crumbs for pie, painting, writing curriculum, voting on motions and asking for help. The Church is in a place where people come from every direction to seek help, and counsel for the obstacles life brings. Columbian is limited in its capacity to give and yet is very generous to people who are in need. Over the last several months news has returned to me that some of the people were less than honest about their troubles, but God nor the Bible tells us to keep tabs on the people to whom we give. The Bible does tell us to be sheep and not goats. To feed the hungry, visit the sick and imprisoned, bring cover for the naked and drink for the thirsty is what the Gospel according to Matthew and Jesus instructs. Needless to say, these lessons are hard and sometimes costly, but we, the church have done our part, we have shared our gifts from God’s generous bounty, and the onus is now upon the recipient. God holds the scales of justice and grace and I am so glad that is not part of my job description. The church’s calling is to proclaim Good News, preserve the Truth, shelter and nurture of the children of God, maintain the worship of God, the promotion of social justice and the exhibition of the Kingdom to the world. Let us be about the business that God has ordained for us and gifted us and let today, tomorrow and the future worry for itself. I just needed to share a little. There are several people who are connected to our church who are hurting. May we go to them and be with them instead of looking at the dollar signs. God will provide. Christ is Risen! He is Risen indeed! Today we gathered to worship the risen Christ in three different churches. Once all of the sheep had arrived at our exit point we started down the road to church and traveled to Singjangwee Presbyterian church a middle size church of about eight hundred worshipers. They have three services every Sunday and I was preaching at the second service, which started at eleven in the morning. We were warmly greeted by and associate of the church whose responsibilities were youth and young adults. This morning one of his responsibilities was to get us to the church on time and with all of his English notes in hand he gave all the information we would need. After arriving at that church we were ushered into the Pastor’s office and given rice cakes and tea, after removing our shoes, of course. As we sat around this table we shared stories of our churches and who we were more intimately. Questions were asked about the state of the church and what the Presbytery might look like. Interests and hobbies were shared and even though the languages were different we were able to share our hearts concern. Before we realized it an hour had passed and my three companions were shepherded to the sanctuary and I was given my shoes and down a narrow steep staircase followed Pastor Hahn to the staging area for those who would lead worship. Elder Oh, my interpreter and the liturgist and ushers were all present. Prayer was offered and down another set of steep stairs I found myself on the sanctuary floor. Pastor Hahn showed me to my seat and worship began with a responsive call and prayer. We were able to follow worship as we had a copy of the service with English and Korean text. The music was joyful and exuberant. A whispered prayer during a time of corporate confession and all of the anxiety melted away. Now was the moment of truth and I stood before a congregation larger than I have ever and I shared from my heart the sermon God and I had prepared. Looking about and making eye contact with many folks in the pew I perhaps was more animated than Pastor Hahn might be, but the message was the same as we worshiped the God of the universe. Luke 13:29 reminds us that all of God’s children are not from the same sheepfold and will come from many directions. The north, south, east and west, and for those who have confessed Jesus and believe in their heart that Christ is Lord will sit at the table of God. What a picture of what the church ought to be as we went to lunch in the fellowship hall of the church and broke bread, much as we might do at a church potluck. For dessert we migrated back to the pastor’s office and shared coffee and sweets with much conversation and laughter. Everything is simple and breath taking at the same time. In the afternoon we met up with the rest of our fellowship and were able to see a Sunday school during the afternoon (3PM) service. The music and Bible lessons were simple and effective, asking children to use all of their senses. At the same time these children were learning Bible, English and what is expected in a church service. The teacher kept their attention until they broke up into small groups and we were escorted to a worship service with some folks from the Philippines who rented space in the church building for their worship. Finally we entered the sanctuary and heard the last part of the minister’s sermon and the rest of worship. This church, Youndong Presbyterian, is in another Presbytery and was served by a missionary James S. Gale from Canada. The history was alive and vibrant as we were introduced to it time and time again, and we were beginning to be overwhelmed by all that our shepherds were giving to us. After dinner we headed off to do a little shopping and a cultural event that included five people who were making music using items we might find in our kitchens. Through out, the story line was of a restaurant where a visiting nephew was part of the mishaps of the chefs and the preparation for a dinner at 6. Laughter at the high jinks and amazement at the knife skills was applauded by the audience, but the real star was the amazing knife work. Skipping ahead to Wednesday morning we woke early and prepared for a full day. The bus met us down stairs at the Mission center at 5:30 and we were off to a prayer service that started at 6. The church we attended was one of the largest in Korea. Active membership is one hundred thousand and the service we attended held at the least five hundred folks. We were just a few pilgrims amongst many and the sound of uttered prayers was breathtaking. To add our voices to the din and know that God hears me just as he does any other supplicant was awe inspiring and so once more we sat in awe of our loving merciful God. Psalm 33:8 tells us that God is Creator of all and so we should stand in awe and respect of a God so big who wants to know my most precious secrets and dreams. 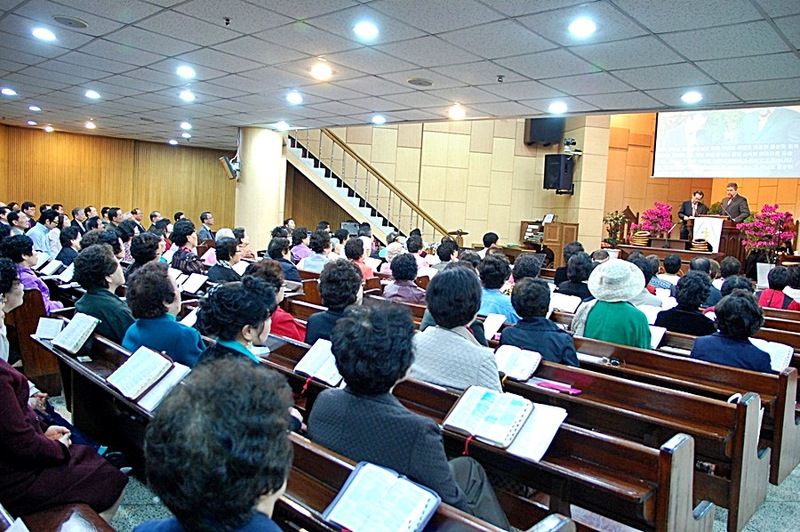 Worship is an integral part of what the people in Korea do. Many of the folks we saw at the Morning Prayer would be there every day of the week at the same time and then head off to work from this place of worship and recharge. God provides for His people and I believe that we in America, particularly in the church have forgotten that God provides. We believe that we might be able to pull ourselves up by the bootstraps and we forget that it is God who called us out of slavery and showed us the way through the wilderness to the Promised Land. We also forget that God calls us each by name and knows our hearts desire. We forget that God desires that none of His should perish and that He wants to be in relationship with us. Perhaps it is time for the Church in America to pray for revival and seek that face of God. God will mold us into His people. Let us seek Immanuel, for God is still with us and has never left us. Christ is Risen! He is Risen indeed! Sorry folks, the internet connection where we are is spotty at best and I really wanted to post a picture with my last entry so I will try to add a few images with this post. Early we arose to start our time here in Seoul and we headed down to breakfast where we could reconnect with our group and some of the shepherds who will be with us all day. After a breakfast of salad and fried eggs we went out to a historical venue: Chang-Deok-Gung Palace. 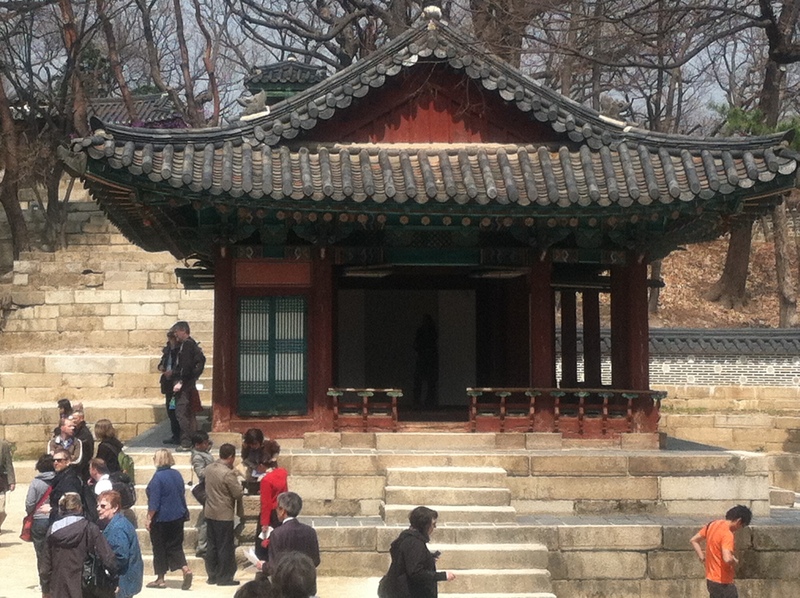 These structures are historical buildings from 1405 and the Joseon palace. During the Japanese occupation this place was destroyed and left vacant. Only after the Japanese left were the y Koreans able to rebuild and they continue to do just that, so that they might hold onto their history and teach others about the culture and history of Korea. It is amazing that we think so highly of our 200-plus years of history in America and for the folks here to talk about six hundred years of history and not bat an eye is commonplace. We spent several hours within the palace grounds and it was amazing to be in this place of pristine beauty and pastoral peace knowing that outside the city walls there are twelve million people and a city that never sleeps. On the backside of the property the sounds of a crowd of folks playing baseball and enjoying the swing of the bat and metallic twang as the ball was struck were intermingled with the tombs and excavations of past rulers. In the midst of this scene we might be tempted to think that God is absent, and yet if one was to listen, to stop and listen, as we are commanded to do in Psalm 46:10. Then we might feel the passing of the Holy Spirit who still hovers over the face of the deep and each of us as well. The walls that separate us, that have always separated people from one another were beginning to seem pale and thin in this place of quiet and study. We had started our journey to the mountaintop and there was leanness between God and us. We could almost see the face of God. After leaving the palace grounds we were treated to a traditional lunch Korean style. We did not sit on the floor but we did enjoy the food of Korea over several courses. Kim chi and beef, octopus and rice cake soup were all delicious and the use of chop sticks around the table kept this time light and full of humor. We learned that the Koreans make the best craftsmen and surgeons because they can use the chopsticks to remove the mung bean from within the soup. The dexterity that they have as they maneuver their sticks around the dinner plate is amazing. We shared conversation and stories as we enjoyed our leisurely meal. After much food and a little sweet for dessert we were off to the Seoul Tower and hiked up to the top where could take an elevator to the very top and have a 360 degree view of the city of Seoul. Etched in each window was the name of various cities that could be seen along that line of sight. We took time to enjoy a beverage and find our favorite view before we headed off for the bus and the mountain highway. 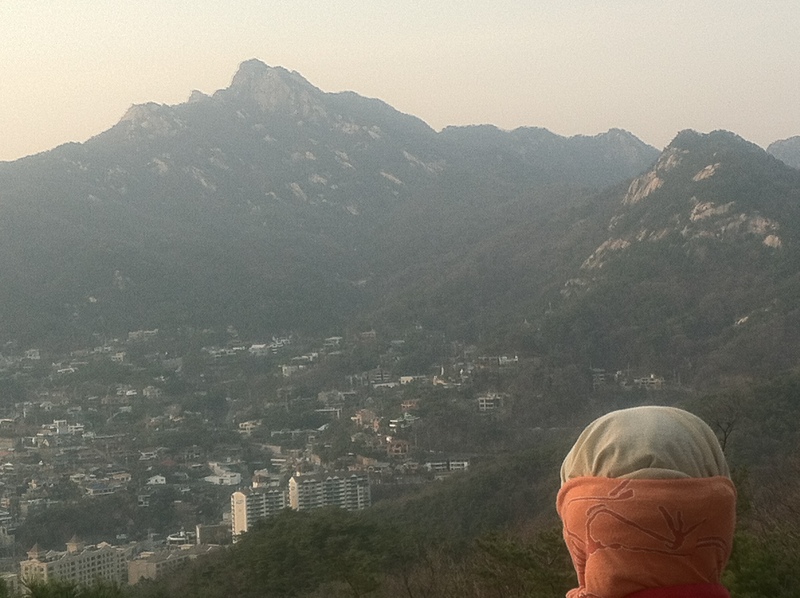 We stopped at an overlook that gave us a view of some of Seoul’s mountains and were told of one mountain that many Christians go to pray and hold vigil all night long. One of the elders who is shepherding us has done this numerous times. This journey allowed us to become more acquainted with our new friends and we shared questions and laughter along with a song or two to punctuate a story. The ladies would sing often of the flowers or other short tunes they perhaps learned as children. There was nothing that separated us as we shared and learned together. We then traveled back to the centennial mission building for the evening and had much to ponder from our day of living history and fellowship. I wonder if Paul ever sat and reminisced over all of the miracles he had seen? To be in a place where everyday and each breath is a gift from God is sweet. To often we believe that something inside of us causes our hearts to beat, but it is God alone that fashioned us and breathed into us His very essence so that we might delight in and enjoy Him forever. It is necessary for us to take the time to breathe deep, breathe deep the breath of God. Peace be with all God’s children. Amen. Wow! It has been eighteen hours on the plane and we are al exhausted and sore form long periods of inactivity and sleeping in an upright position. 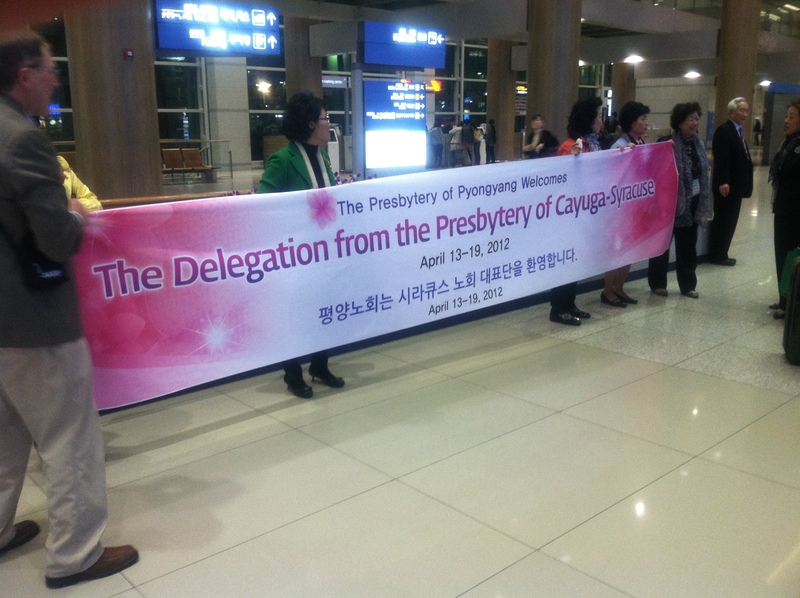 But here we are touching down in Korea at the Seoul airport where we are greeted by several members of the group that is hosting us. With a large banner and equally large smiles await us as we step out of the door and into their care. After introductions and greetings all around there is time for a few pictures before we are shepherded into the bus that awaits us. Traveling out of the confines of the airport we are greeted by a city of twelve million people with all of the lights, traffic and noise that only a city can produce. The views are stunning even in the darkness. We are shown several historical and prominent buildings. Then we begin to see the lights that signify a church. Red, blue, and white crosses cover the night sky and in one case a small yellow cross to show the entrance to a church at street level. After the hubbub of the city we are surprised by the quiet as we turn off the main road and into a side street that brings us to our destination for tonight. We have arrived at the Centennial Mission building and our home for the next week. Inside we are greeted by the fruit basket and gifts that the women have given us. Little pieces to say thank you and we are glad you are here; spoken without any words but through a smile, a touch or the joy in a greeting from someone we met on a previous trip. Finally it was time to get some rest as we had now traveled across the International Date Line and were looking at close to twenty hours without a bed. As we turned off the lights we knew that if anything were to happen these folks, our partners in this pilgrimage would take care and shepherd us through the darkness. We had found another safe place to call home, and the body of Christ is not concerned with Greek or Jew, woman or man, slave or free, for we are all found in Christ and we are free indeed. This time of travel has once more reminded me of the familiar passage from Hebrews that reminds us we, like Abraham are living in tents and traveling through this place to the place where God is calling us. A journey such as this one asks us as God’s children to dig deep, to search our souls and see if we are truly God’s children or only a dim reflection. Coming to this place on the opposite side of the globe begs us to change, begs us to peel away the chaff and seek the face of God. Tonight in the airport we were able to see just that in the faces of all those who came to greet us. This is not about race, ethnicity, or the color of skin but the chance to see the “image of God” in each other. These thoughts race through my mind as I drift off to sleep on a pillow made of beans. Peace, blessed peace washes over me and I find rest. On Tuesday afternoon a group of pilgrims gathered at Pebble Hill Presbyterian Church to deal with the last details of a trip to Korea. As many pilgrims do before an epic journey the small group asked questions about food and clothes to pack, and if there might be any secrets to the journey. Those who had gone before spoke of little tricks to help with packing and the travels ahead. After a couple hours of conversation and decisions being made the meeting was over. The pilgrims headed for home and wondered if they had headed down a slippery slope of chaos for the next week. Fear is a real obstacle in going to a country half way around the world with different foods, and language. 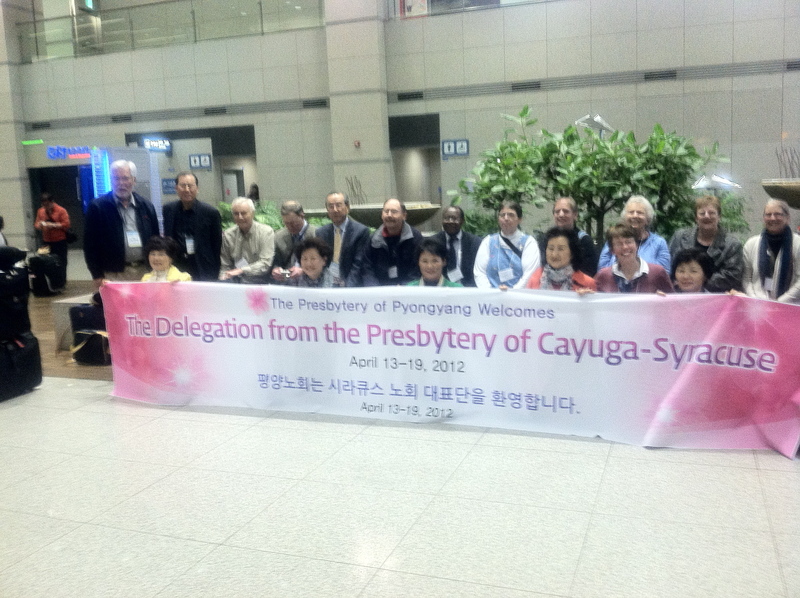 This little group of travelers will need the prayers of the Presbytery and their fellow parishioners. We go to share good will and the joy of the empty tomb with our brothers and sisters who are celebrating one-hundred years of being part of the body of Christ. All of us as the children of God in the world today. 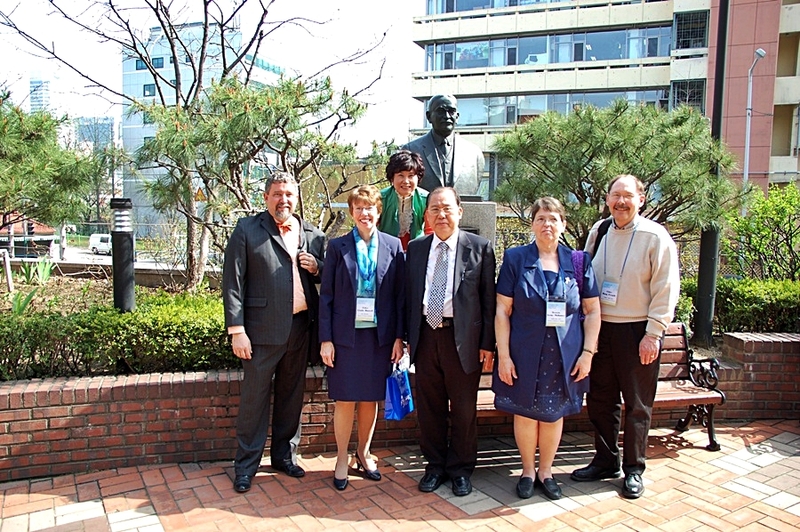 In the days to come we hope to shed some light on the mystery that is Korea and share with the entire Presbytery the joy of this journey. See you in a few days.